Dental implants might be a phrase you have heard recently if you are dealing with gingivitis (gum disease), periodontal disease, or if you have suffered an injury and need to replace missing teeth. This complete guide will give you all of the prices for a single tooth or multi teeth implant and hopefully answer most of your questions about implants. It sure is not a cheap procedure so you need to know the dental implant average price to prepare yourself and check what this dental solution will mean for you in terms of budget. How much are dental implants ? We know implants do tend to be more expensive than other dental options. But what is the average cost of a dental implant ? Well, the price depends on many things, including your individual dentist, the type of implant, how many teeth you need to be replaced, which teeth you need replaced, and your individual insurance. Once you are able to get your first appointment in with your dentist, you will be able to get a clearer estimate but to give you a rough idea of what dental implants cost, here is a complete and detailed list of prices. Typically, a single tooth implant will cost between $1,200 and $6,000. 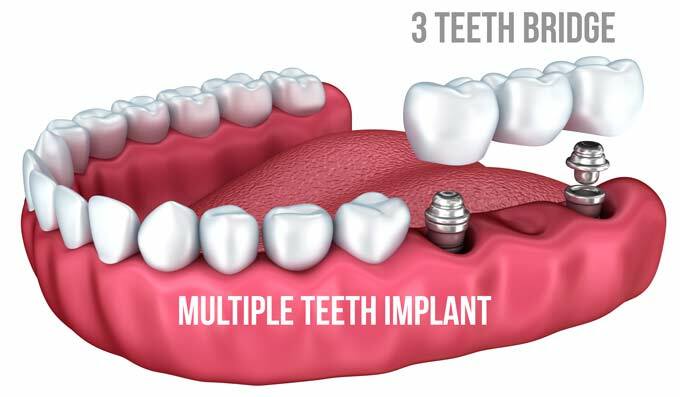 Remember that an implant is made up of 3 parts (implant, abutment and dental crown). An abutment and crown usually cost between $600 to $3,000 per tooth. 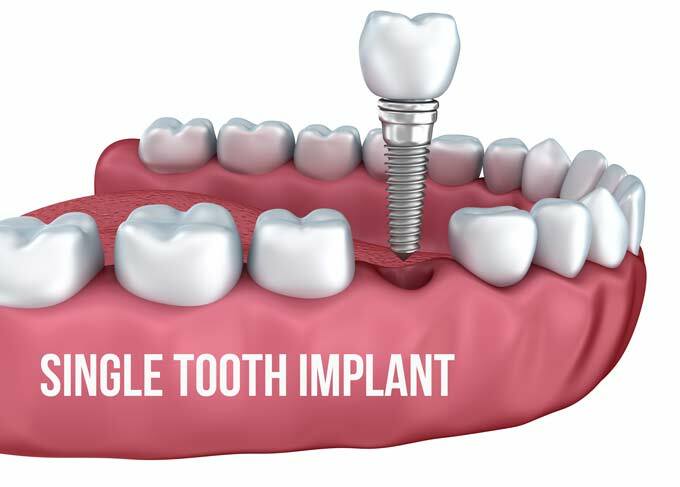 The implant (the post that mimics the natural root) usually costs anywhere between $600 to $3,000, so the average dental implant cost for all procedures, including the abutment, crown, and the implant is about $4,200. Implants can also be used to replace several adjacent missing teeth, you would then have 2 implants which could support 3 teeth via a bridge. That is the best way to avoid paying for 3 implants. With an implant supported bridge, you will only pay for 2 implants. For a bridge with 3-4 teeth that are mounted on two implants, the cost can run anywhere between $3,000-$14,000. A full arch also called a full implant supported denture, which is basically a bridge with 6 implants, will run you $17,000-$40,000 – depending on the condition of your jaw, gums, and any existing teeth. So for a full mouth with a full set of lower and upper implant supported dentures, you simply multiply the price by 2. Please note you also have the all-on-4 implants that also can replace all your teeth in lower or upper jaw by using 4 posts in very precise locations, this a full arch denture that is supported by 4 implants; check the procedure and the lower cost for this all-on-4 technique here. Of course you might wonder why there is such a gap between the lower price and the upper price. additional procedures such as bone grafting, sinus lifting. To be able to insert implants in your jaw you need to have enough bone to start with. The thing is with age, our bone density can decrease so for some patients, before the implant procedure itself, they need to get some bone grafting. This technique basically adds some bone to the site where the dentist will insert the implant. Bone grafts (whether simple or complex) could add to your bill $ 300 to $3000. When you get your quote, remember to check for these things as well as other hidden fees. There are costs in everything, from the implant and the abutment, to the anesthesia and crowns. You might even get extra costs for scans. You have the plain dental X ray. It is the basic imaging option. You also have the dental CT scan (computerized tomography scan). It is a 3D scan of your skull and teeth which enables your dentist to perfectly plan the surgery. If you need to get a tooth removed before for any reasons, you also need to take that into account in your total bill. Yep , nothing is free…. If you can see the tooth, it is a non surgical tooth extraction, but if the tooth is broken off under the gum line, or if the underlying tooth is too large, that is a surgical extraction. The price won’t be the same. So how much does a tooth implant cost ? You know by now it can be very expensive, that is why some people, in order to save a few dollars, will go to foreign countries to get a cheaper option. That is what we call dental tourism. The most popular destinations for this type of procedure include India, Africa, the Philippines, and South and Eastern Europe. But as a reminder, you need to make sure the dentist you will consult there is qualified. Do your research ! Be aware, however, that your safety and health is far more important, so look for someone who will do a high quality job that will last for a long time. Don’t scrimp on quality just to save a few dollars. You probably wonder if you can get your implants paid by your insurance. Well, that depends on your insurance and its policy. The first thing you need to make sure is that your insurance company will cover any of it. Contact them. Usually they only cover about 10-20% of what the procedure would cost, but if there isn’t any coverage, don’t lose hope. Many dentists will set up a payment plan so that you can put a little down and then pay monthly. Others will give you a discount if they can use you as a reference. In fact, an insurance company will cover more if you go with a traditional route meaning that old denture route, but that is changing slowly. Why? because implants are often considered to be a cosmetic procedure, but sometimes you can work around that if you can prove that it hinders your health in any way. If you are still struggling to find the money to afford this prcedure, check our article listing 10 ways to find cheaper implants here . Some of our readers managed to save thousand of dollars by using them. A dental implant looks and feels like a real tooth, but it is actually a titanium model made to look like a real tooth. It is inserted into your jaw and held in place with an artificial root. The titanium is biocompatible with your jaw bone, which means that it fuses (This is what we call the osseointegration phase). These implants act to stabilize the jaw, which helps to prevent bone loss and keep the jaw’s shape. Implants, unlike dentures, never come out of your mouth – which allows your mouth to get used to them, so they are more comfortable. Eating and talking will be easier because there isn’t any messy cement or pesky wires, which will naturally eliminate gagging, poor alignment, and the dreaded sore spots. There are two different implant models. The subperiosteal model is a metal frame that is put into your jaw, below your gum line. The posts will protrude though the gum and hold the prosthesis in place. Subperiosteal models aren’t normally used, but can be effective for patients who do not have the jaw height or thickness required for endosteal types. The model that you will get really depends on the condition of your current teeth, gums, and jaw bone. beside this criteria, your dentist will also have to choose your implant size, diameter, surface types etc… for your case. Qualified patients will have healthy gums and a strong jaw bone so that they can hold the implant in place. Sometimes patients will have to undergo strict routines before they are able to qualify. This means that you can’t skip those brushes when you are too tired – and flossing is no longer something you can just say you do! Before surgery, you dentist will likely take a lot of time and planning to identify, analyze, and plot out your nerves, sinus cavity, the size and shape of the bone in your jaw area, the dimensions of your bone and mouth, and other areas of your face as well. You will likely have to get an x-ray that will show bone density. Your dentist will look at things like your upper and lower teeth to determine strength or problems, your bone health as well as its height and thickness. CT scans will likely be the option that your dentist goes with because it is the most accurate and detailed. Other tests may be given to test your teeth and gums for damage, disease, and decay. I know it might seem like a lot of work and testing, but it is important that your dentist know exactly where to insert the implants and avoid any nerves. Implant surgery is an outpatient procedure that is performed at the dentist’s office. You will be required to get anesthesia via intravenous sedation or nitrous oxide (laughing gas). You can have the surgery done by a dentist, periodontist, or an oral surgeon as long as they are qualified. During the first stage, your dentist will make an incision into your gum to expose the bone. Then, he or she will drill a hole into your bone; this is where the implant will sit. The implant will sit completely in your jaw bone and will come through the gum. Then, the gums will be stitched back together. In some cases, a temporary covering may be used to protect the implant. As your mouth heals, your bone will grow to bond to the implant in a process that takes anywhere from 4 to 6 months. Once this process is finished, then you will have go to get the abutment put on top of the implant. This is a post that will stick through your gums and connect to the future crown or replacement tooth. Typically you will be under anesthesia for this process, but it is an outpatient surgery. In some cases, they will be able to install both the implant and the abutment at the same time. This is what we call immediate loading. That is difficult for some people because they have to take extreme care not to put any pressure on it during the healing process. Healing will take about two weeks, and then you will be able to finish your procedure. Swelling, bruising, minor pain, bleeding, and a little bit of grumpiness are normal during the healing process. However, your dentist will likely advise you ways to relieve the pain. Follow them carefully to minimize the discomfort. After you are completely healed, an artificial tooth ( the crown) will be made from impressions and models that you took at an earlier date. These models ensure a proper fit and bite. This crown will be attached to the abutement. So you now have a complete tooth, that looks exactly like a natural one among your other teeth. If you have more than one tooth to replace, you will probably get a bridge or prosthesis, as it is cheaper and more durable than replacing each tooth separately. In this case, usually an implant on either side will hold several crowns into place. It is similar to dentures, but is a more permanent and natural solution. Implants have many advantages over other dental solutions such as bridges as long as you find a skilled dentist you can trust. ( Read our article on how to find a good one here). The first is that it is permanent, which also means that it is far more stable and durable than other options like dentures. Permanence means that you will be able to eat whatever you want (Apple! Pears! Popcorn!) without worrying. As they do not need to be removed, you won’t have to mess around with cleaning or messy adhesives. Your maintenance will be simply what you are already doing – brushing and flossing. Speaking of, implants make it easier to clean between your teeth which will keep your gums in great shape. The risks involved with getting dental implant surgery are minimal, and rare if your dentist is skilled. Some of the complications include: bleeding, bone not connecting to the implant, numbness, sinus problems, nerve damage, and infections. A lot of your success will depend upon the strength and size of your jaw bone and the amount of implants you need. However, there is still a high success rate and that number is growing as we learn about what works and what doesn’t. Lower jaw implants have a 95% success rate and upper jaw implants have a 90% success rate. The difference is because the upper jaw is not as dense as the lower jaw, which makes oseointegration less easy. All in all, while you are looking around for options to replace a missing tooth or teeth, it can be quite stressful and even a little scary. Remember that there will be more discomfort than there will be pain, and dentists do this type of work every single day. Talk to your dentist and see if he or she thinks that dental implants might be the solution for you.